One of my favorite kinds of recipes, three ingredients! You know this recipe is a good one, look at the old 3x5 inch card it was written on, doesn't it look like it was taken right out of an old wooden recipe box? Who still has one besides me? I enjoy reading old recipe books, I have quite a collection of interesting ones and periodically part with ones that are duplicates like this Jingle Bells and Pastry Shells recipe book from 1968. I also like easy recipes and one with only three ingredients qualifies. 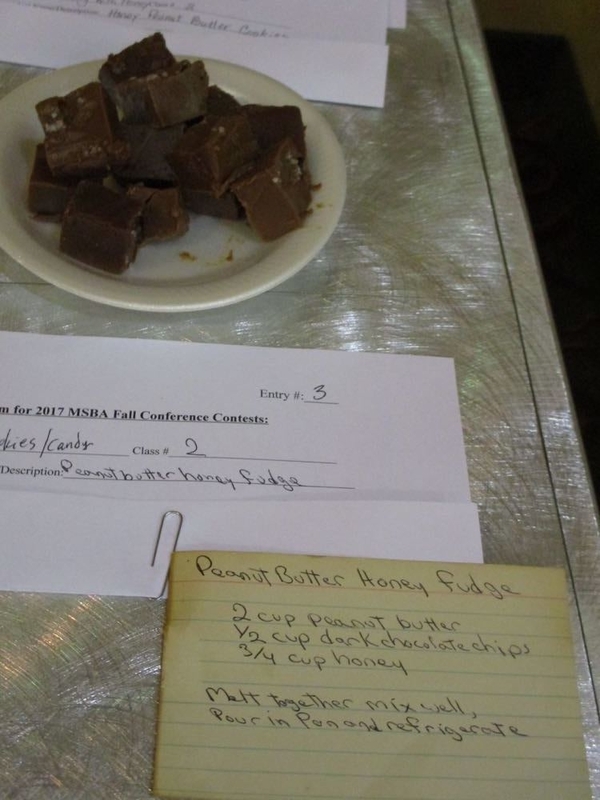 I have a peanut butter cookie recipe with only three ingredients so why not a peanut butter honey fudge recipe? Combine peanut butter and chocolate chips and microwave at 30 second intervals mixing each time until melted and smooth. Add in honey and mix well. Pour into 8x8 baking dish lined with foil. Refrigerate until set. These were a little sticky to pick up with fingers but still quite tasty!